Alan Girling writes "It’s curious how some items mysteriously come to light. 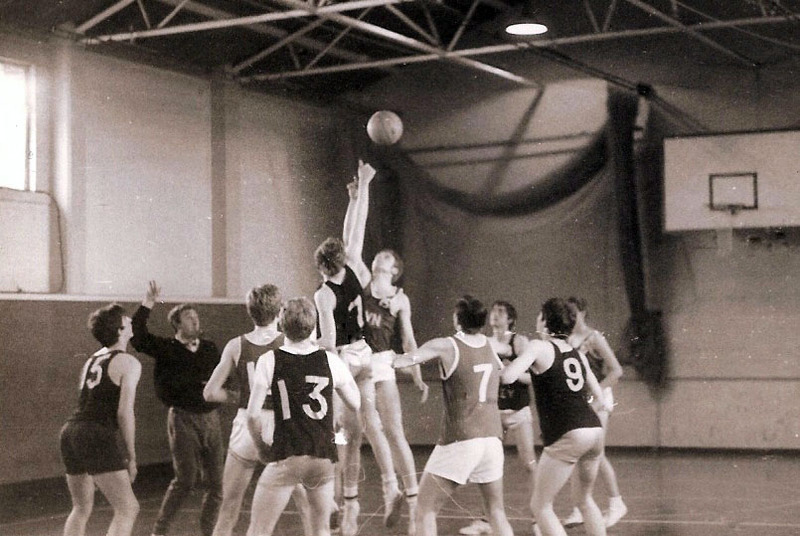 You may remember the basketball team photo I sent you of the 1966-7 team which won the Surrey Schools U19 championship, and I described how we beat Glyn by 2 points in a play-off (which was actually held at Wimbledon school). Well, looking through some papers I found in the loft, the attached photo just randomly fell out. It’s a picture of the tip-off of that very game (I think taken by Roger Stansfield which suggests he might have been injured for the game. I know he did photography). Our heroes in black are, L-R, Mike Pye (15), Stef Simpson (13), me (7), Colin Wood, and Steve Taylor (9). The guy I appear to be beating at the tip I think was Jim Chappell, and the Glyn no 7 was Adrian Webb, both of whom Colin and I played with in the Surrey Schools U19, and Adrian and I shared a room when we toured New England with Surrey Schools in March 1967. Jim went on to play for Sutton and Crystal Palace in London League and possibly the early days of the National League. I don’t know who the ref was but I expect he was useless! Some things never change…"